I had a walk through Pearson Park Wildlife Garden in the afternoon. It was sunny and mild and I was hoping to see the first butterfly, or 7-spot ladybird of the year. There is a lovely flowering heather struggling amongst the fence posts and I checked it. 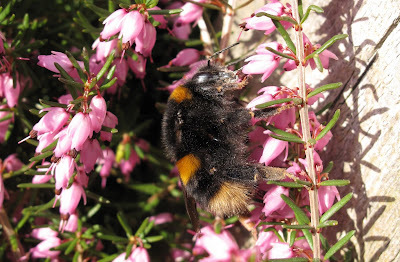 Two beautiful, fresh looking Bombus terrestris queens were lazily feeding on it, accompanied by a drone fly. Note the tawny end of their abdomens, which identifies them as queens. 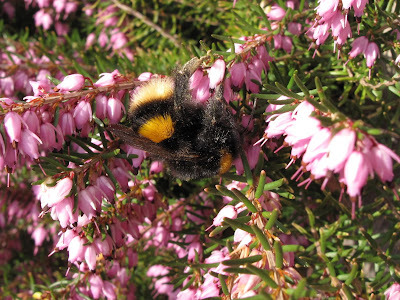 This large heather must be such a priced source of nectar and pollen at this time of year. I will be more fastidious this year recording the flowers on which I find each bumblebee species and write a blog with my results. Bumblebee watching is one of my favourite activities in the summer with my large lavender hedge and nectar-laden Hebe always humming with them. I have recorded all six common species, at least a cuckoo bumblebee and the new arrival Bombus hypnorum in my relatively small garden.